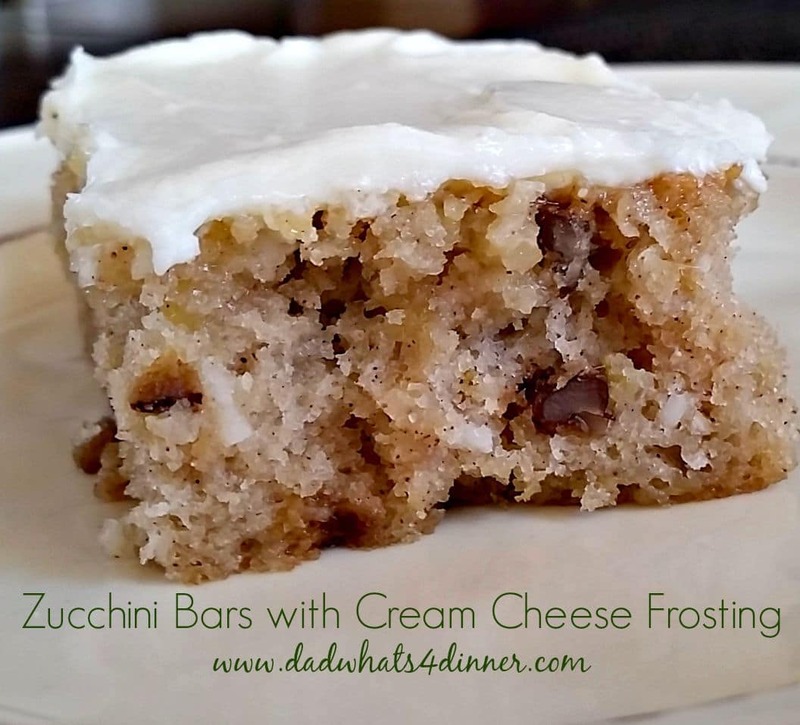 Zucchini Bars with Cream Cheese Frosting is a great use for all of your extra zucchini harvest. You will never know it is made with zucchini. What to do…What to do…What to do with all that extra zucchini? 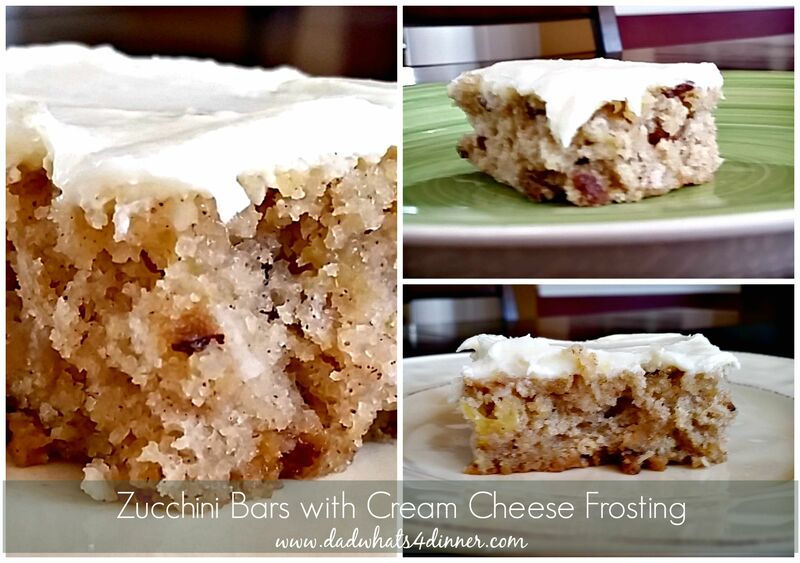 Well, this recipe will make you want to grow more just so you can make these Zucchini Bars with Cream Cheese Frosting. Very easy and the kids will never know the recipe includes zucchini. Most people have heard of using zucchini to make bread. In fact, you can use zucchini to make many sweet treats just like you can with carrots. When using zucchini remember to drain it and squeeze out as much liquid as possible. These bars taste like a spice cake with the addition of pumpkin pie spice and the use of pecans and dates. You can substitute walnuts for the pecans and raisins or craisins for the dates. I personally like the use of dates in this recipe. 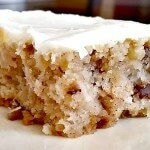 The Zucchini bars would also be good made with black walnuts. Black walnuts have a very strong unique taste that you either love or hate. I have a few recipes using black walnuts that I need to share. 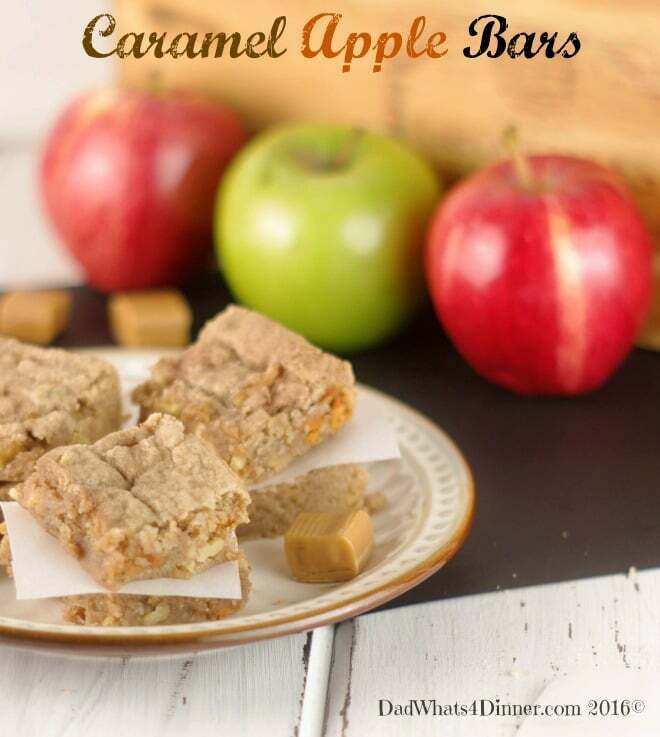 These bars would be perfect to take to a fall tailgate party or the teachers at school. 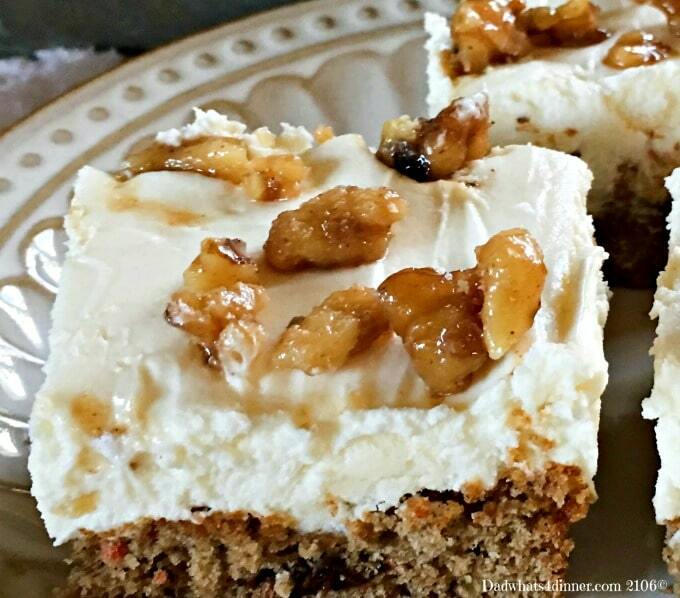 The cream cheese frosting knocks them out of the park. They are also great for breakfast. What is your favorite use for Zucchini? In another bowl sift together flour, baking soda, baking powder, salt and pumpkin pie spice. Slowly add to mixing bowl with mixer on low speed. Stir in zucchini, coconut, pecans, dates, vanilla, and pineapple until batter is formed. Do not over-mix. Pour batter into a lightly greased or parchment lined 10x15-inch sheet pan. Spread on top of the cooled cake bars and serve or refrigerate for a few hours to allow frosting and bars to set up. Whats your favorite Zucchini recipe? Looks gorgeous AND delicious! Thanks for sharing! Thanks Trish. They sure don’t taste like zucchini. Have a great week. Don’t know where I just commented! Lol 🙂 anyway, looks delicious! I love zucchini in anything! I even add zucchini to the dal (Indian food) that I make! Ok, I think I left you a message instead of comment, duh! Just ignore the message. But the cake looks awesome! OK Obviously my site is confusing on how to leave a comment. :(((( What are you guys seeing that doesn’t make sense. 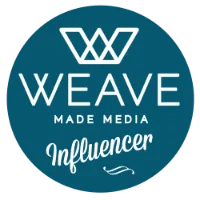 I am still trying to figure out this self hosting business. Thanks for your feedback. Right below the recipe there’s a place to submit a message that I mistook for a place to write a comment. Although in the end, both serve the same purpose, I guess. Message, comment…same thing? Thanks Julianna. 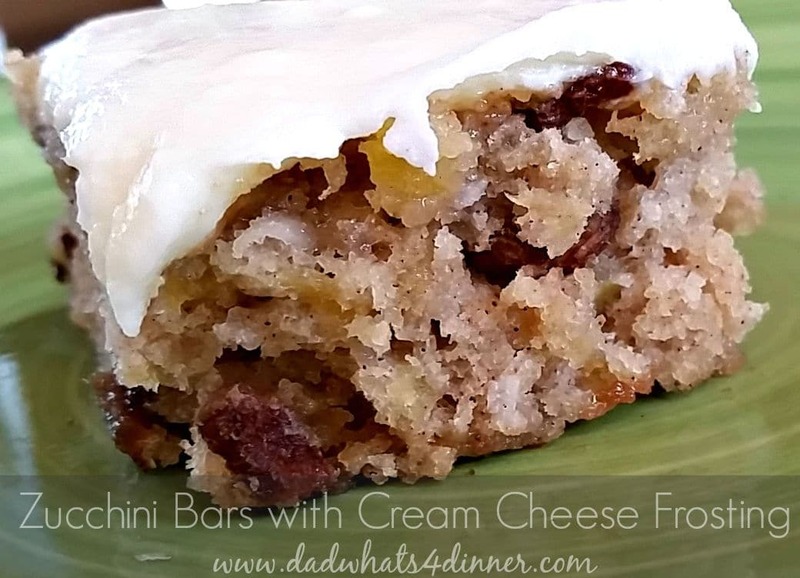 These bars are tasty and you can’t beat cream cheese frosting. 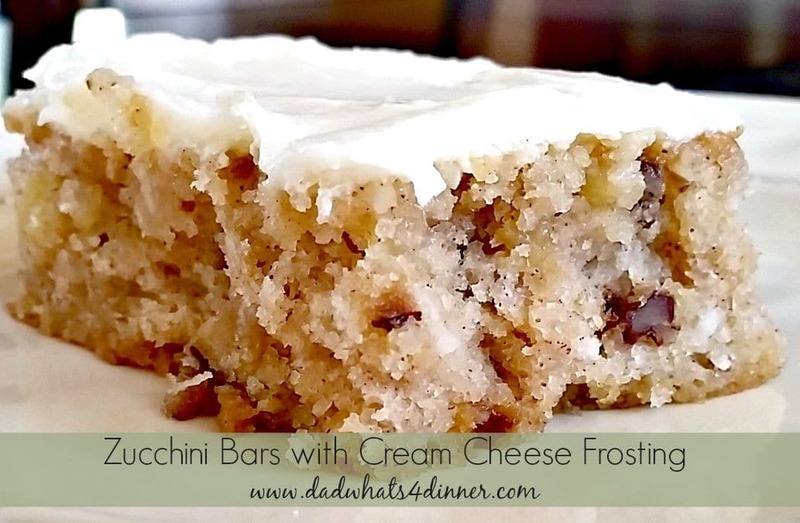 These bars look so good and moist!